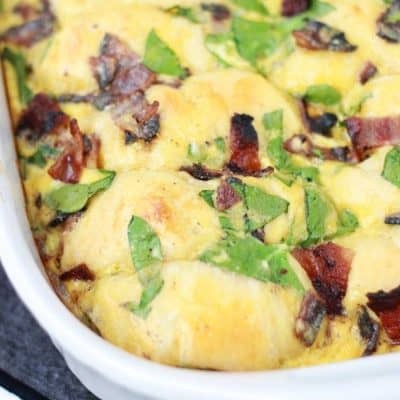 This bubble up breakfast bake made with crescent rolls, bacon, spinach, and eggs is perfect for breakfast, brunch or for a quick weeknight dinner! It’s easy and beautiful, most importantly it’s DELICIOUS. Oh you guys. I am newly obsessed with breakfast casserole. 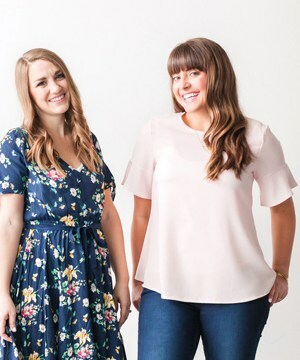 It all started with the World’s Best Breakfast Casserole – which Jessica shared on this blog back in 2013. Since then it’s been one of our most popular posts and as of today the video on facebook is just below 5 million views! WOW. We have never had a facebook post go viral before this. But I can attest, that breakfast casserole is amazing, as I myself have made it over and over again in the past few years. So now I’ve been trying new recipes, hoping to find more winners! I found one. 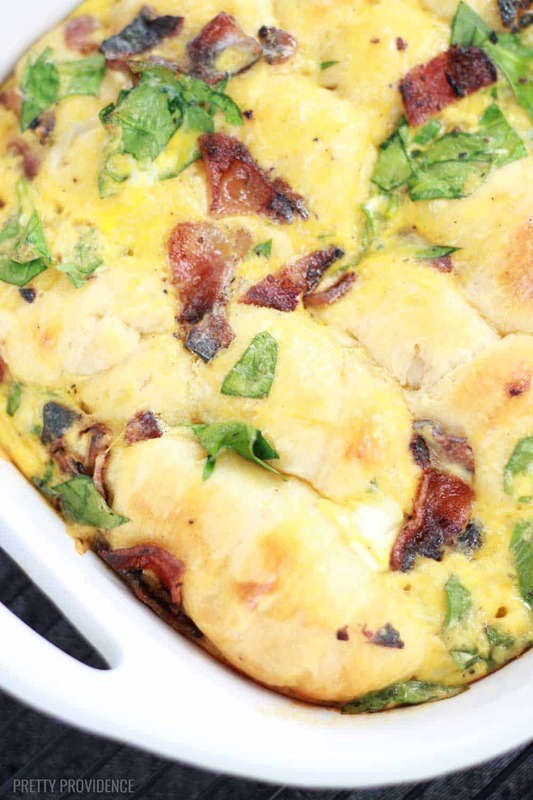 This bubble up breakfast bake is DELICIOUS. It’s fluffy. It’s beautiful. I could barely stop myself from getting thirds. Did I mention it’s beautiful?! And it only takes five minutes to put together. It starts with crescent rolls from a can and then when you bake this, everything bubbles up – hence the ‘bubble up’ in the name! SO GOOD. I love to use applewood smoked bacon for this but I think any thick cut bacon will do. It also includes cheese, sour cream, eggs and spinach. These are a few of my favorite things! I’m definitely going to be making this for Easter brunch. Maybe Mother’s Day too? There’s no shame in serving the same thing twice if everyone loves it, right!? 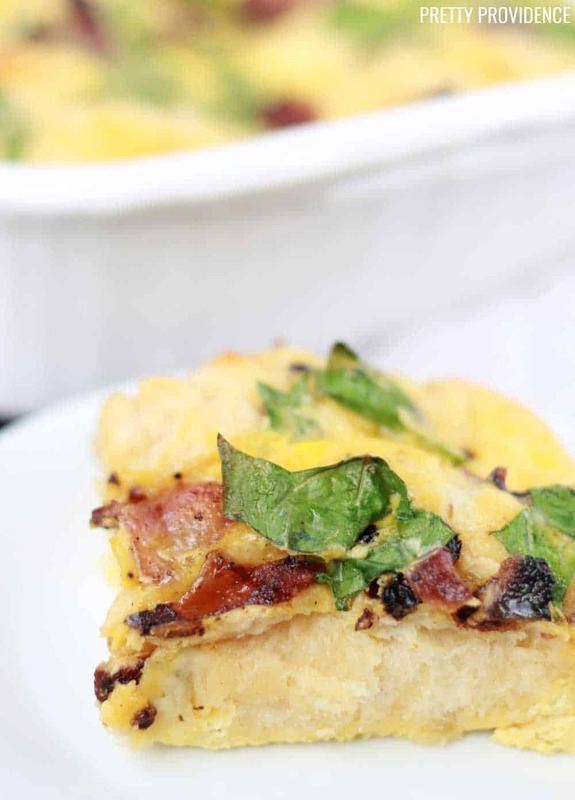 My family LOVES this bubble up breakfast bake! 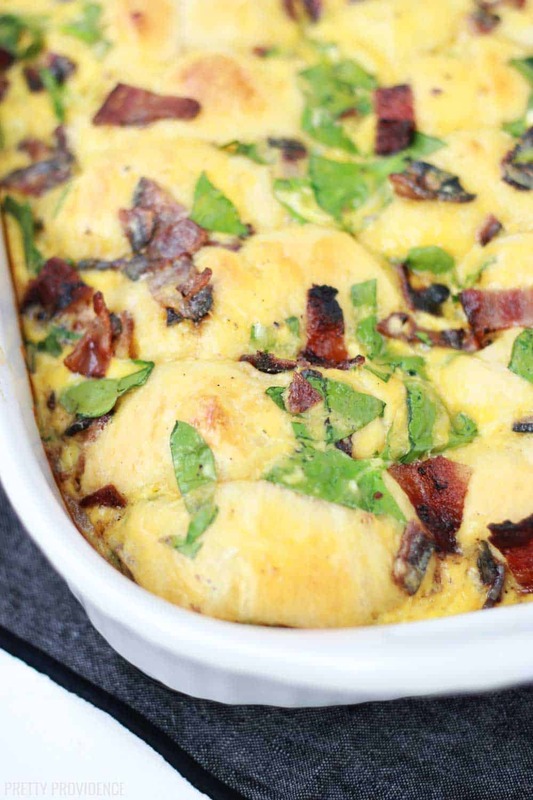 It's great for breakfast, brunch or for a quick weeknight dinner! Preheat oven to 350 degrees and grease a 9x13 dish. Open crescent rolls and roll dough according to package directions. Line them up in the 9x13 dish spaced evenly. 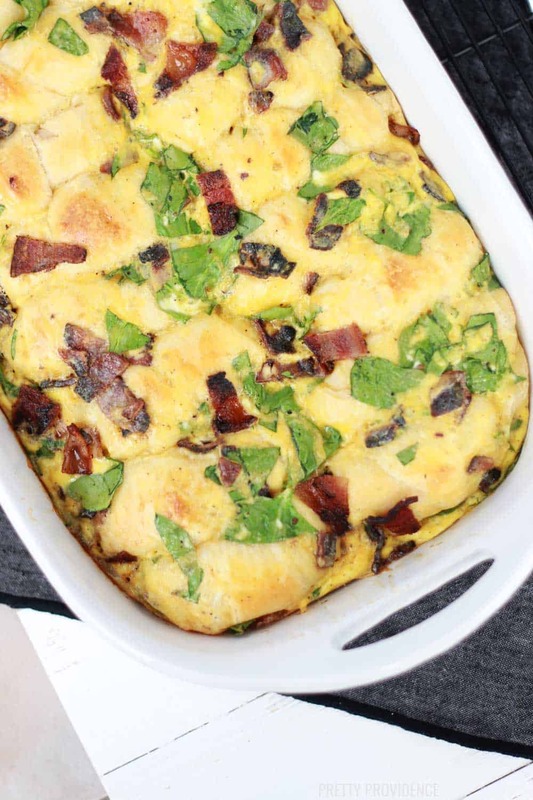 In a large bowl, whisk eggs together with sour cream, cheese, chopped bacon and spinach. Pour egg mixture over the uncooked crescent rolls. Bake until it's just starting to brown and the rolls are cooked through.